Galapagos Cruise Ships - Isabella, Evolution or Legend? Galapagos Cruise Ships – Isabella, Evolution or Legend? Decisions, decisions, decisions…which Galapagos cruise ship makes for the best Galapagos cruise experience? Let’s take a moment to break down the pros and cons of each ship, the Evolution, the Isabella and the Legend. Alright, who are we kidding, there are no real cons, only pros so here they go. The Evolution, one well known Galapagos cruise ship claims to offer comfort and luxury that reach a new level. It’s a mega-yacht and gives the feel of a 1920’s party boat with the modern conveniences and safety features. It accommodates 32 passengers, has beautifully furnished salons, open decks and private areas for close experiences with the surrounding environment. In addition there is a hot pool, bar and sunning deck available, along with an outside social and observation area under a canopy covered deck. A tour leader and naturalist guide will accompany each voyage and answer all your questions about Galapagos, each island and the marine and wild life that dwell there. For those wanting a closer look, the Evolution is equipped with clear acrylic sea kayaks for a rare glass bottom glimpse and scuba gear is readily available for longer and deeper exploration. The Isabella, a yacht fit for 40 passengers, boasts an expedition culture that can be felt throughout the ship. Week long itineraries offer the best comprehensive tour of the Galapagos Islands, but Isabella has four and five day outings if you are short on time. Isabella is a luxury ship, but what sets her apart that you might not found on other ships is the star gazing program, natural history lectures, and the young pirates program which caters to children on board. Isabella is a larger vessel compared to the smaller ships that sail through the islands. If you’re prone to sea-sickness, Isabella’s larger size provides a smoother ride which may help alleviate motion sickness. Snorkeling gear is also available on board for those wanting to capture those once in a lifetime intimate encounters with underwater cameras. The Legend, a Galapagos cruise ship in a high class of its own. It can accommodate 100 passengers, but it is still small enough to gain an intimate experience with nature. Customize your vacation on Legend for as few as four days or as many as fifteen days. The Legend is best described as an “elegant adventure.” With four decks, a swimming pool, a library/reading room and extra space cabins your vacation would be combined with comfort, relaxation and education. 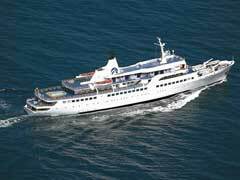 This Galapagos luxury cruise ship comes staffed with 60 crew and 7 naturalist guides. All three Galapagos cruise ships offer international cuisine with bold South American flavors. Traditional food options are a great way to enhance your cultural culinary dining experience while taking your Galapagos Islands cruise. In addition to the three ships, Evolution, Isabella and Legend, the cruise liner Celebrity cruises Galapagos as well. The Celebrity Xpedition has a sailing schedule set for 2012 and by visiting the Celebrity website; you can view amenities and prices.